I had the notion of throwing an afro onto the Woody, and then painting her chest in a tie-dyed fashion. I didn't have the time to paint her though, but I still thought that keeping the afro would help differentiate her from the rest of the field. I realize that the afro isn't really necessary here given the context of the scene, but I hope that it doesn't detract either. The 'fro is actually a chunk of black packing foam/insulation. I cut it out and then shaped it gradually with a pair of scissors. The setup consisted of me walking out my back door, setting the woody on a bench in my backyard, and shooting a grand total of 1 shot. I barely took anything into consideration here, and of course it shows. I just wanted to enter something into this challenge. I had no real ambition going in, though. 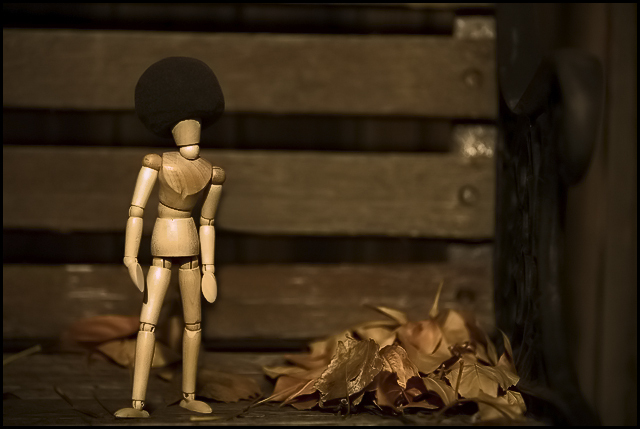 You are beautiful Afro Woody!!! I love the hair, the pose, and the lighting. I don't understand how it fits into the "rustic" setting with a wood bench and leaves, though. A laugh always gets a vote. Here's 9! Wow, I think the lighting, dof and color pallete for this picture is wonderful. I think there is just slightly too much dead space on the right side. I think everything here almost looks great. The leaves have a perfect dof and colour, the background has great colour and very nicely blured. Couple hotspots on the woodie... and The AFro is just way to Low on his head. Maybe needs to be a little bigger as well, and higher up. But a very nice idea and image overall. Good but a little too dark to really show off the hair. Heh! Like the "golden" leaves, too. Microphone cover as a wig, maybe? Nice pose, too. I grinned when I saw this. Great idea! Nice idea. Unfortunately, the afro is mostly lost against the background. Given that the afro is black, a lighter background would give better contrast. Also, an additional afro tie-in would help, maybe something '60-ish. yo my woody. love the setting. Ha ha. Would have been nice if there was more definition on the afro. It kinda blens with the background. Non the less, great shot. Way cool! You have got the whole Woody Stance just right: excellent body language. Also like the general hues. Woody's afro tends to disappear into the black horizontal...maybe a slightly lower angle would have helped with this? lol - even the stance is in character! Oooh, against a lighter background woulda been great! Ohter than that, clever, creative and a warm and funny image! Great job. whats up woody...you looking good!!!! Proudly hosted by Sargasso Networks. Current Server Time: 04/19/2019 04:16:03 PM EDT.